Asking the Right Questions: What Do I Want to Know? 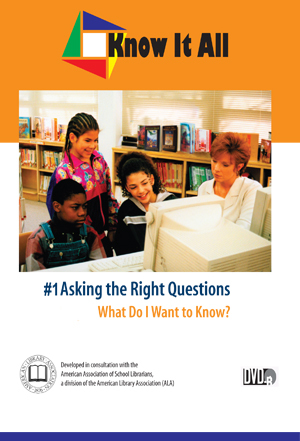 Home > • Language Arts > Know It All > Asking the Right Questions: What Do I Want to Know? Step 1: What Do I Want to Know? Curriculum Focus: Art--What is art? Trouble with an art project forces Taylor to ask the fundamental question: what is art? Her search for an answer leads her to a number of people and sources, including a local art gallery. Taylor is so inspired by what she discovers that, in addition to her report, she creates an art piece that reflects her special interests. Your students will discover along with Taylor how to narrow a topic, refine and reframe questions, and clarify what information they need.